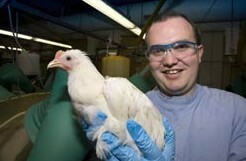 New Poultry CRC research is aimed at developing a non-invasive test to assess welfare status in birds. The project is led by joint project leaders Drs Tamsyn Crowley and Anthony Keyburn, from Poultry CRC participants, Deakin University and CSIRO, respectively. Anthony and Tamsyn plan to use cutting-edge genetic technology to create a new test, which will exploit the properties of small non-coding ribonucleic acids (RNAs), called microRNAs or ‘miRNA’. There are a number of existing behavioural and other tests (such as blood and egg cortisone levels) that provide insight into the welfare of poultry. However, if this project is successful, it will provide a clear cut and non-invasive scientific test to determine the welfare status or stress levels of birds, especially laying hens, in various production systems.